Return of the Jedi saw the largest merchandising blitz of the three original trilogy films. As a result, a phenomenal variety of licensees cranked out unique point of sale displays to entice consumers into buying their products. 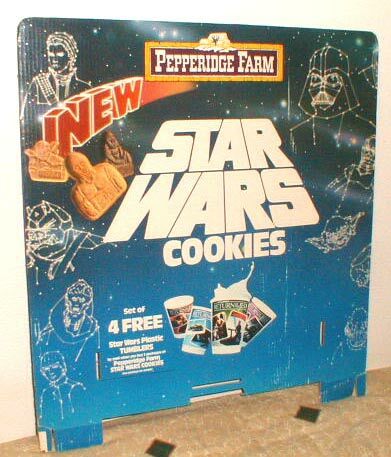 Pepperidge Farm produced tasty Star Wars cookies in the likeness of various characters. The header card seen here once affixed to a bin display cradling a multitude of cookie boxes. It promotes the plastic tumblers offer where consumers could mail in for 4 star wars cups. The display is a true testament to the 80's era of unique and visually appealing store displays. Unfortunately today's companies are often forced to use mundane images as mandated by Lucasfilm which translates into homogenous retail display areas.